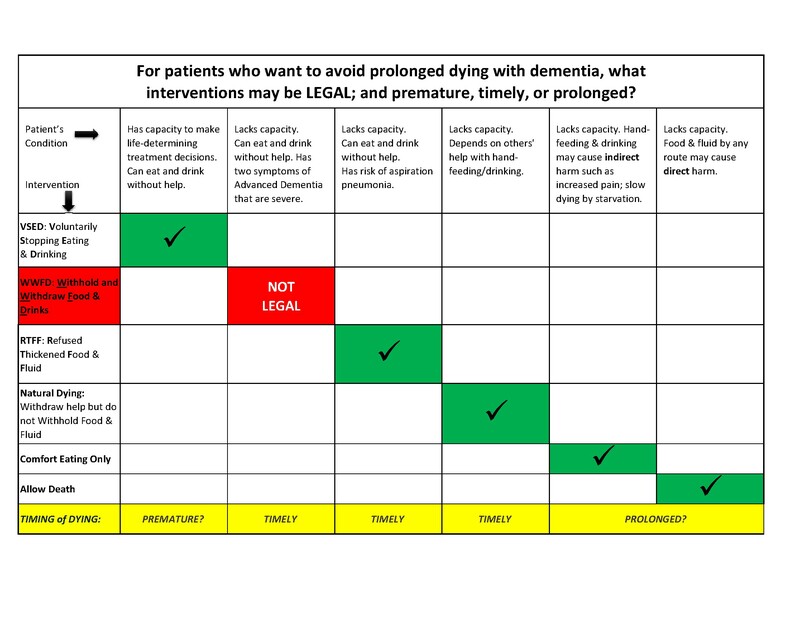 To avoid PROLONGED dying with dementia: which interventions may be LEGAL? And, can health care professionals also help patients avoid PREMATURE dying? —A video for those interested in Dementia and/or strategic Advance Care Planning. This 32-second video convinces some viewers that unrecognized pain can be a serious problem for Advanced Dementia patients. It is included in both the complete video and video (c). (b) “A strong plea for a timely, peaceful dying by Young-Early Onset Dementia patient, Michael Ellenbogen.” (15 min) https://youtu.be/VJ6h3pmDPtY Michael shares his personal story and what he knows about other patients. (c) “An Advanced Dementia-specific Living Will. 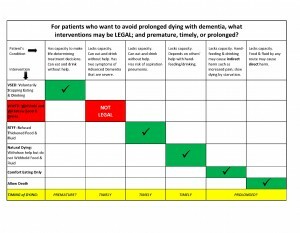 Michael Ellenbogen demos making one decision at a time.” (14 min) https://youtu.be/i8HbZp9pbaI Shows how to use the decision aid tool that generates an Advanced Dementia-specific Living Will. (d) “Help us legalize the option to Withhold and Withdraw Food and Drinks for Advanced Dementia patients.” (4 min) https://youtu.be/235GbrpRtdE This is Michael’s mission: to increase end-of-life options for patients who will be suffering with Advanced Dementia. Store all YOUR forms and videos for rapid retrieval. 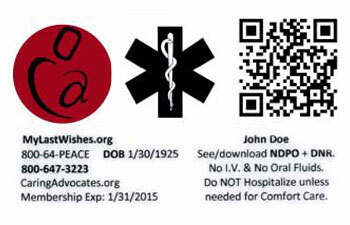 The www.MyLastWishes.org Program is a national registry that stores your forms and videos, to let clinicians use their smartphones, tablets, and computers to rapidly view emergency orders; obtain downloads/faxes of your clinical and strategic forms; and view videos by you and your physician. It further these goals: to avoid unwanted treatment; to increase your chances of surviving a medical emergency; to provide your contact information, address and map (if you get lost); and to display videos to convince others to HONOR your Last Wishes if the time has come for you to attain have a timely, peaceful transition. My Way Cards or Natural Dying Living Will Cards—an illustrated decision aid tool that generates a clear and specific Living Will that (A) informs your future physicians and others WHAT treatments you do, or do not want, and (B) serves as a guide so others will know WHEN to implement “Natural Dying” (if it is your choice); for example, if you suffer a bad car accident, a stroke, or reach Advanced Dementia. Unlimited, life-time updating opportunities of your Living Will (as long as you can still make treatment decisions). Just mail, fax, email or upload your updated “My Decisions Table” to Caring Advocates. Caring Advocates professionals can evaluate your present Living Will and recommend suggested wording for you to indicate which one you want to prevail—if in some areas, your two Living Wills may conflict. A set of Natural Dying Forms to implement your personal “Plan Now, Die Later—Ironclad Strategy.” Includes the Natural Dying Agreement (a bilateral contract between each of your proxies/agents and you); and the Natural Dying Affidavit (that most consider to be their “trump card”). A Consent Form for Relief of Unbearable Suffering that you and your current physician can sign, to help ensure that in the future, you will receive what treatment is required, for any kind of unbearable pain. A $50 coupon toward Caring Advocates’ current price for its Thirst Reduction Aid Kit (TRAK), which you can purchase any time to use to help reduce symptoms of dryness, such as thirst. Telephone and e-mail support from Caring Advocates’ staff, to help you complete all forms and videos for your strategic Advance Care Planning. A ten-minute phone or SKYPE consultation with Caring Advocates’ Medical Director, Dr. Stanley A. Terman and then a $50 discount on his professional fee for consultations of one-hour or more.